Celsia manufactures heat pipes in all shapes, sizes, and performance characteristics for use in its custom heat sink designs. Their high thermal conductivity, the ease with which they can be bent and shaped, and their exceedingly long life make them an ideal upgrade to solid metal heat sinks or, in some cases, an alternative to pumped liquid cooling systems. Heat pipes are comprised of a case (a sealed pipe), a working fluid (usually water) which changes state from liquid to vapor, and a wick structure which moves the liquid from the fin stack (condenser) to the heat source (evaporator). There are three commonly used wick structures, each with unique cost and performance characteristics. Ordered from highest to lowest by cost, performance, and ability to work against gravity they are: sintered powder wick, screen mesh wick, and grooved wick. More commonly known as Qmax, the maximum heat carrying capacity of heat pipes generally increases with the diameter of the pipe. However, each wick type can be tuned to optimize specific performance parameters and this is especially true of sintered wicks. If the engineer knows that the heat pipe will be required to operate in orientations between -50 to -90 degrees, the wick structure can be optimized to increase the capillary pumping action. 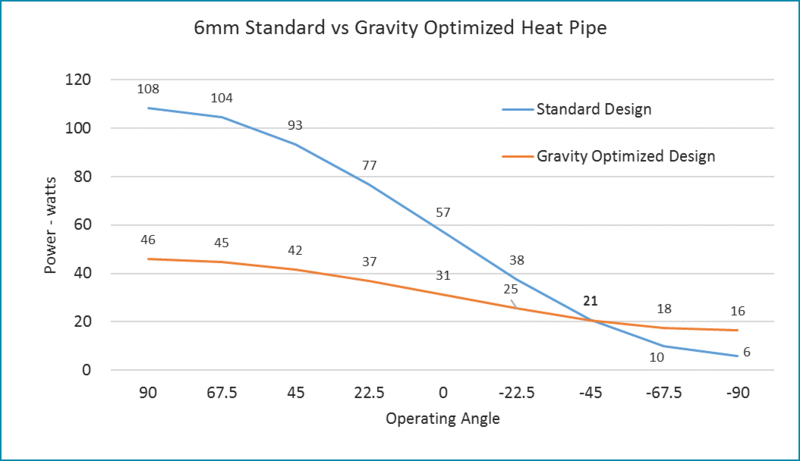 As seen the chart below, a gravity optimized 6mm heat pipe now has a higher Qmax, than its non-optimized 6mm counterpart, to meet the needs of this application. The trade-off? Its Qmax is lower than the non-gravity optimized 6mm pipe in orientations above -45 degrees. Heat pipes can be made into virtually any shape by bending and/or flattening them; subject to certain parameters. The typical minimum bend radius of a heat pipe is 3-times the diameter of the tube. However, bending will reduce its Qmax, the maximum power transport capacity. Smooth, gradual bends will have less of an effect than tight ones, but a good rule of thumb is for every 45-degree bend Qmax will decrease by 2.5%. Please contact Celsia engineering@celsiainc.com for detailed information regarding your application. 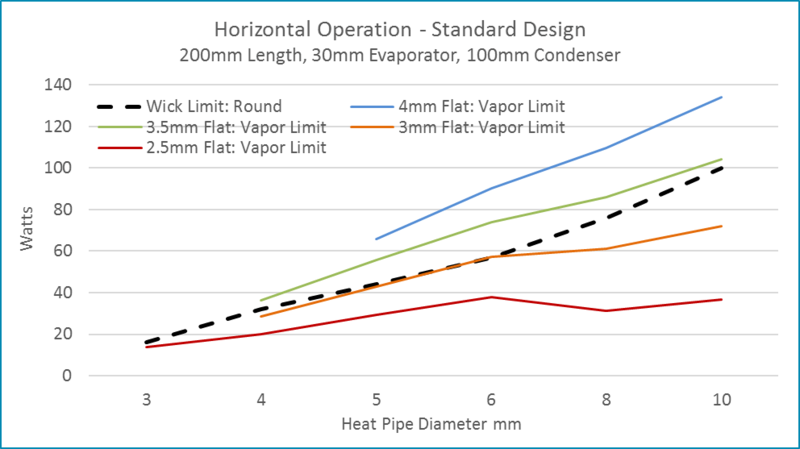 The chart below offers some insight into how flattening affects heat pipe performance. Provided a heat pipe is properly matched to the application, its Qmax is determined by the lower of the wick limit or the vapor limit. For instance, for a round 6mm standard heat pipe the wick limit (black dotted line) is just under 60 watts. Flattening it to 4, 3.5, or 3mm has no effect on its Qmax as the vapor limit is above the wick limit. Note that flattening a round 8 or 10mm heat pipe to 3mm or 2.5mm will have a substantial effect on its Qmax. These numbers are based on typical designs. Other designs may be able to be thinner while “performance” designs may require additional thickness. Knowing the effective conductivity of a heat pipe or vapor chambers is important when performing CFD modeling of two-phase devices which are integrated into a thermal solution. Regularly published heat pipe thermal conductivities range from 5,000 to 100,000 W/m-K. That’s up to about 250 times that of solid copper and 500 times that of solid aluminum. However, engineers should confirm the conductivity numbers for their specific application Unlike solid metal, the effective thermal conductivity of heat pipes varies tremendously. Two-phase device performance varies with a number of factors including temperature and power densities the effective conductivity of these devices is a snapshot of operation at a given operating condition. This is typically done at the worst case condition for the device. The effective conductivity numbers are derived from a calculated delta-t factored with the power (Q), the cross-sectional area (A) and the length the heat is being moved (L). 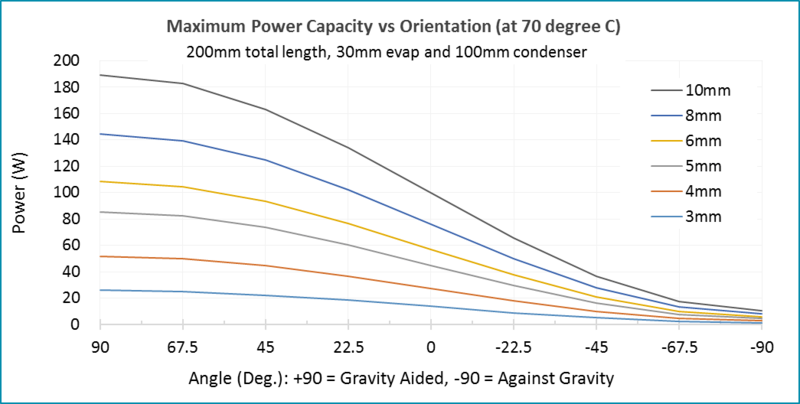 Length is the dominant factor in conductivity calculations. 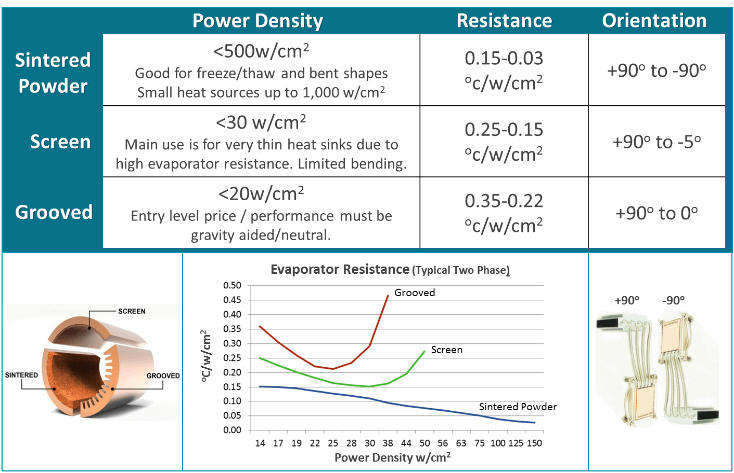 The figure below illustrates the effect of length on heat pipe thermal conductivity. In this example, we used three (6mm) heat pipes to transport heat from a 75 watt power source. While thermal conductivity of 10,000 W/m-K is achieved at just 75mm heat pipe length, a 200mm length has a conductivity of just over 44,000 W/m-K.
How Does Bending Affect Heat Pipes Performance? Heat Pipes & Vapor Chambers – What’s the Difference?